Both those saws seem like they’d be up to most any task. Any idea of the availability, or lack thereof, of General parts in the event that they’re needed? 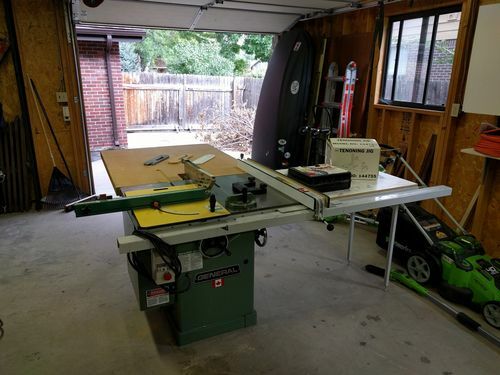 Also, hard to imagine that the General seller would be willing to part with all the extras for nothing (or an extra $100 bucks) if he’s insisting that you buy them in order to get a better price on the table saw. From where I’m sitting, the Delta seems like the best fit and bang for the buck. As for the model/year of the Unisaw… well, it’s a right-tilt Unisaw, which is pretty much all you need to know (they didn’t change much from the late 30’s until around 2009 w/the redesign). If you can get the serial number, you can determine its age. It was built sometime between 1989 and 2009 since it’s missing the front dust door. 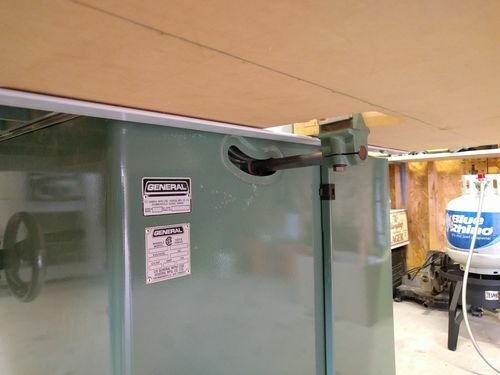 That’s the Canadian made General 650…..left tilt version of their venerable 350, and is one of the most rugged of the industrial style cabinet saws. It looks to be in excellent condition. Brad and I usually agree, but in this case I’m not convinced the Uni is the better saw. Either way, both are really good saws, and both seem to be fair deals. I’d take a look at both, decide if the tilt direction matters to you, and see which one floats your boat. Thanks for the replies guys. I agree with Scott about the appearances and was leaning toward the General if I can get it for $1200 or for $1700 with the accessories. The Unisaw guy still hasn’t replied, so that one may be out of the picture anyway. Only real drawback to the General is although it looks like light use, the seller just moved and doesn’t have 220 service to test it out. From what I’ve heard right tilt doesn’t require recalibration after a blade change, but left is supposedly safer. It probably doesn’t matter for me. ........From what I ve heard right tilt doesn t require recalibration after a blade change, but left is supposedly safer. It probably doesn t matter for me. shopnotes/woodswmith magazine(s) noted that left tilts are safer when bevel rip cuts are executed. I ended up going with the General 650. 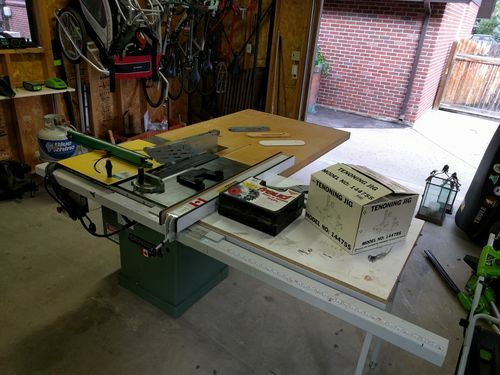 The saw, side extension, outfeed, dado, miter, and tenoning jig all for $1700. 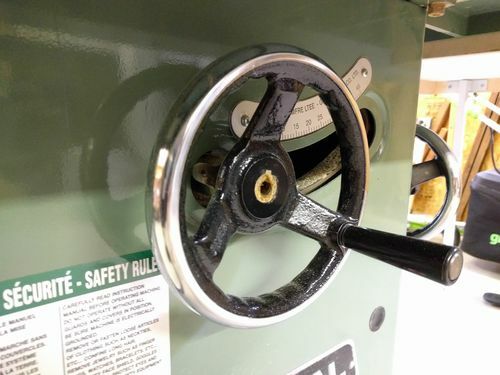 The lock knob on the blade height wheel was broken off so I’ll have to remove the broken threaded end stuck in the wheel and buy a new one. Also, the cylinder on the back of the saw where the splitter attaches is bent. Hard to imagine how it got bent since it is so beefy, but I can unscrew it and was able to get everything working for now. I definitely want to replace it ASAP though since that splitter is a nice safety feature. Anyway, here are some pictures of the setup and now to find a planer! Jet, Dewalt735, or possibly Cutech. I’ll create a new post once I learn a bit more on those.